Detection Techniques: Each click on an Google AdSense ad is monitored by Google system or their proprietary software. Mostly, Google will record the IP address of each click, the time of the click, and duplicate clicks. So, it’s better not to perform self-clicking even using different computer. 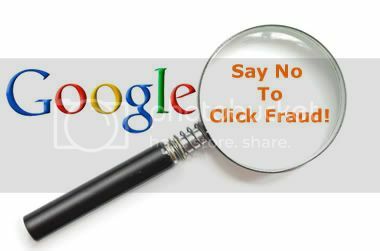 Google Specialized Tools: Google team always uses the specialized tools & techniques to check individual click fraud. If Google system detects that is potentially an invalid click, then the member’s account will have higher possibilities to get banned. Besides, the easiest way for an account to get banned is by clicking on the site’s own ads. Google always watch for multiple clicks from the same domain. If there are the spikes in click-through percentages, which rise from a consistent 1% click-through rate (CTR) to a 20% click-through rate (CTR), then your account could become suspect. Final said, please don’t click on the site’s own ads ever. Remember one thing, once Google bans your accounts, the revenue is returned to the advertisers. This entry was posted on Sunday, December 6th, 2009 at 1:01 am	and is filed under Internet Advertising. You can follow any responses to this entry through the RSS 2.0 feed. You can leave a response, or trackback from your own site. Yeah, you are absolutely right! Once you are banned you are blacklisted forever from Google. Dont try to cheat google, do it properly and you will get more than what you expect. Just landed on this place via Google lookup. I love it. This post change my percept and I am fixing the RSS feeds. Cheers. Very Good Post, i think you should make a new article discussing the benefits of blog commenting, because this to can increase sales and website traffic. but i will subscribe to your blog for more updates. Neverever try to outsmart Google. Dont even try to click 1 time on your own ads. Too risky. Once your adsense account is Banned, it is banned for life!